Reduce the damaging effect of FADING! It’s not unusual for carpets and furniture to lose color over time, especially when they’re exposed to sunlight. Sun fading, specifically, is a type of oxidation; it most often occurs near windows. Color fading is so subtle that it sneaks up on you. A little fading each day and before you know it, the color has faded away. You sometimes won’t even notice it until you move a piece of furniture and realize how much color has faded in the sun. This can be costly to repair. 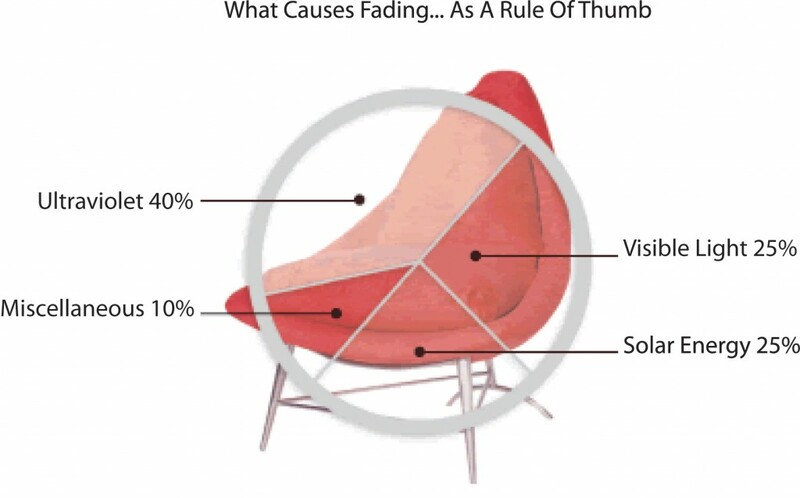 Fading is caused by a number of factors but the damaging effects can be controlled. The largest single cause of fading is ultraviolet rays. Panorama solar film blocks 99% of ultraviolet rays — virtually eliminating fading damage to the interior of your home! Some of the things that can be damaged by the sun’s rays are hardwood floors, wood cabinets, carpet, decorator rugs, upholstered furniture, paintings, photographs, draperies — even your child’s artwork. You spend a lot of time and money decorating your home, and Panorama window film can help keep that investment looking new! As the diagram below shows, fading is usually caused by several factors, often acting in conjunction with one another, including light (both visible and ultraviolet, and solar energy. Window tinting provides a host of benefits. While nothing can prevent fading entirely, Pacific Window Tinting can help keep the interior of your home looking new. Plus, modern residential films are so light in color, you’ll hardly notice they’re there! Pacific Window Tinting is a female-owned business that’s built its reputation on exceptional products, installation, and customer service. Since 1998, we’ve been Oregon’s most trusted and respected provider of premium window tinting for both commercial and residential properties. We provide worry-free window tinting so our customers can feel confident that they’ve entrusted their window tinting projects to the best. We use only the highest quality products at fair prices, and we always guarantee our work. If anything goes wrong, we will make it right. Contact Pacific Window Tinting today, and let’s get started on a project that will enhance the value of your home — while protecting it from the long-term, damaging effects of the sun.